The sky is spotless. There’s not a single cloud in sight. Its hue: A pale blue that’s similar to the shade of houses many choose to have coated in this dry, desert land. Apparently the colour helps to cool interiors against the scorching heat during summer. But in December, Jodhpur is blessed with a breezy, almost-salubrious climate. And the weather is perfect for al fresco dining and chukkas of polo. Hosted by the Maharaja of Marwar-Jodhpur, Gajsingh II, British Polo Day India has been a key institution in the city since 2008, in which Royal Salute has been a part of for the past six years, hosting exclusive experiences in between games and galas. It’s a fitting partnership, as guests get to warm up with glasses of whisky, poured from the iconic Royal Salute porcelain flagons, which typically is glazed in various tints of blue. 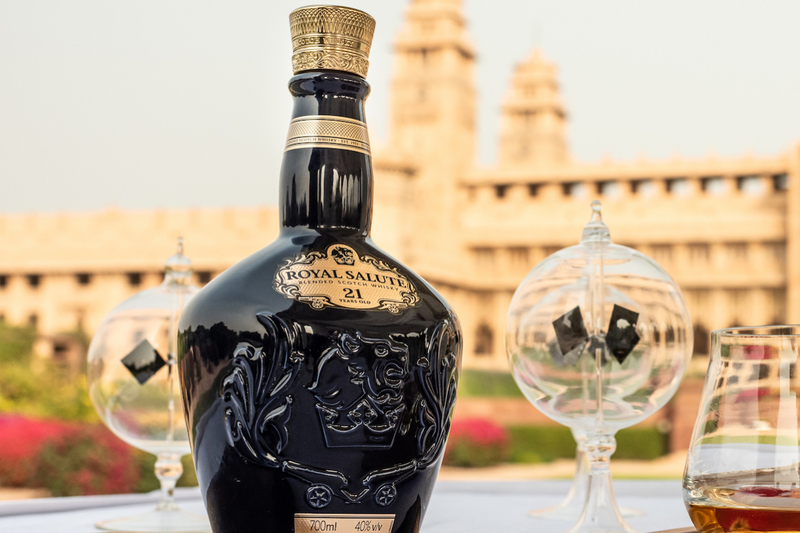 The handcrafted sapphire bottles are seen at almost every event during the three-day polo-party gathering of dignitaries and dukes in India’s famous “Blue City”, including Royal Salute’s one-of-a-kind Olfactory Studio experience with Barnabé Fillion. Of course, Royal Salute’s appointed creative advisor (a talented mixed bag of a person himself, who started off as a photographer-model and now, famed perfume designer for Aēsop, Comme des Garçons and Paul Smith) is here to venerate the prestige range of blended Scotch whiskies. Many have akin blending whisky to an art form, and for Royal Salute, it’s a time-consuming one as their whiskies feature single malts that have been aged for a minimum of 21 years. And that’s why, the luxury brand has engaged Fillion to help people understand and appreciate the age-statement drams by way of stimulating all the senses, inspired by nature. From sniffing out harmonious botanical extracts, to feeling up a chunk of two-million-year-old fossil — existence and time seem to be of the essence during this session. Even the flourishing flower arrangement before us represents the seasons, a passing in phases, critical in making whisky. Still, the scents, such as cardamom essence and the funky balsamic extract of sea shells, take centre stage and are paired with haute cuisine served in sync by hotel staff alongside five glasses of exquisite single malts, namely Strathclyde, Longmorn, Glen Keith, The Glenlivet Nadurra and Strathisla. To further open his audience up to a new dimension of awareness, Fillion decided, for the first time, to invite his friend, perfumer and performer Jahnvi Lakhota Nandan, to the table. With a perfect blend of poise and edge, Nandan charms the audience through dance after dance, and adds on top to what Fillion’s been proposing in terms of key notes and visuals to complement the whiskies. Of choosing not to stick to just one form of expression, Fillion adds: “For me, the original spirit and how it’s created is very important. Nomadic tribes suddenly became sedentary and had to create a sort of belief for the transition of their relation with nature. That’s how dancing came to be, which celebrates pagan rights: to ask for the rain. Apart from my own creativity, I always think of the beauty of that first dance. It’s not to get drunk or wasted but it’s to celebrate all of nature.